So, you have your water flosser, be that market leader Waterpik or from another brand. You might not be aware, but mineral deposits from water, mouthwash and other materials can collect on or within your water flosser and may affect the pressure and cleaning effectiveness. If you want to keep it in great condition and prolong its life, there are a few simple steps that you can take to keep your flosser clean and in good working order. What are those steps and what is the best way to clean your water flosser? There is no perfect or must follow strategy for cleaning your water flosser, but the following are common approaches and techniques that manufacturers advise. If you don’t yet own a water flosser and are doing your research ahead of buying one, you may find our water flosser buyer’s guide useful. Please note: The following is general guidance that applies most to Waterpik water flossers. Do always consult the manual for your product to ensure the steps are in accordance with the manufacturers advice. Unless specifically necessary, ensure the flosser is disconnected from the power supply before cleaning. Although you need not do this everyday, it can be beneficial if you complete the following steps once a week. The best way to do this is to after use, continue to run the water flosser until there is no more water in the reservoir and none is being ejected from the tip. Once the water has all gone, continue to allow the unit to run for about 10 seconds, to draw in air though the pipework and push out any residue moisture. You may too want to give a wipe in and around the underside of the reservoir as this is a common place for excess moisture to build up. Lift the reservoir off the unit or position it in such a way that air is more easily able to reach the underside of the water tank and the inlet in which the water flows into the flosser. If your reservoir has a lid, you may want to open this or leave it ajar for air to flow inside. Leave it this way until you next come to use the unit. The airflow allows for parts to dry out and reduce the chances of bacteria buildup. Following on from the tips above that you should complete ideally once a week the following you should complete approximately every 4 weeks to a month. Don’t be concerned if you forget or do it every 8 weeks. The products are well built and designed as best as possible to last. However, by following these steps you give the best opportunity to your flosser to continue performing at its best for longer. The water reservoir or water tank is the part of the water flosser, be that a countertop or cordless unit that you fill up with water and/or mouthwash. First, ensure the unit is powered off and disconnected from the power supply. Lift out or disconnect the water reservoir from the unit (refer to your instruction manual if required) to allow you to clean it away from the water flossing unit. 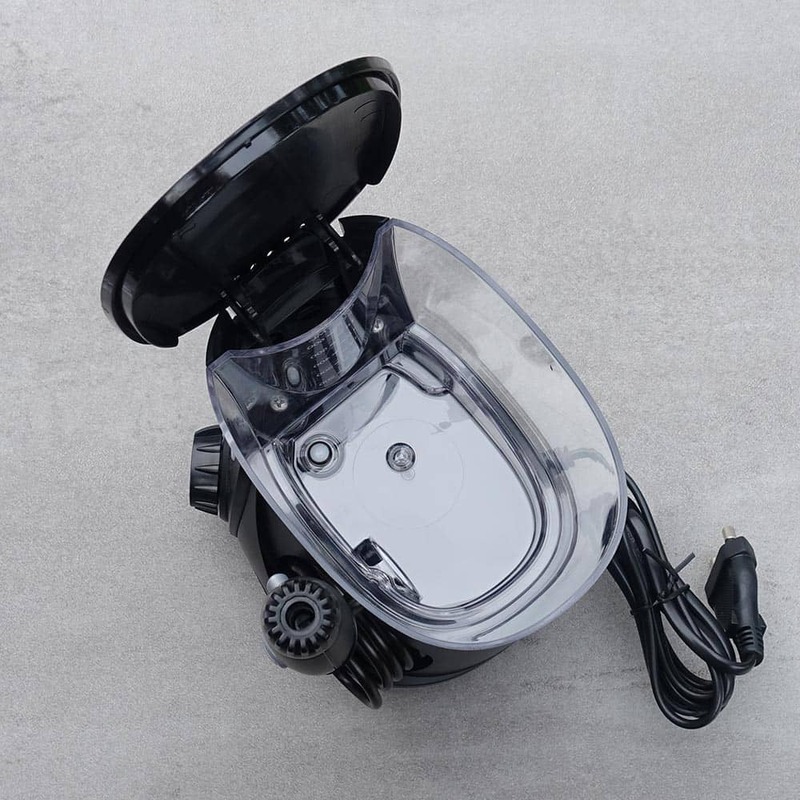 If there is a rubber valve in the base of the reservoir (normally countertop models), remove this and clean it by running it under warm water for 30-45 seconds. You may choose to use a non abrasive cleaner on it too. Once the valve is clean, gently dab dry with a kitchen towel and set to one side to fully dry out. In most instances (refer to your instruction manual), the reservoir can be cleaned, by placing it on the top rack of your dishwasher. It is advised that you let the reservoir air dry naturally, rather than using the heated drying cycle your dishwasher may offer. For those without a dishwasher or who desire an alternative option, rinsing with warm water, a soft cloth and a non abrasive soap in a sink is also fine. Once both the value and reservoir are clean and thoroughly dried, replace the valve by pushing it into place. 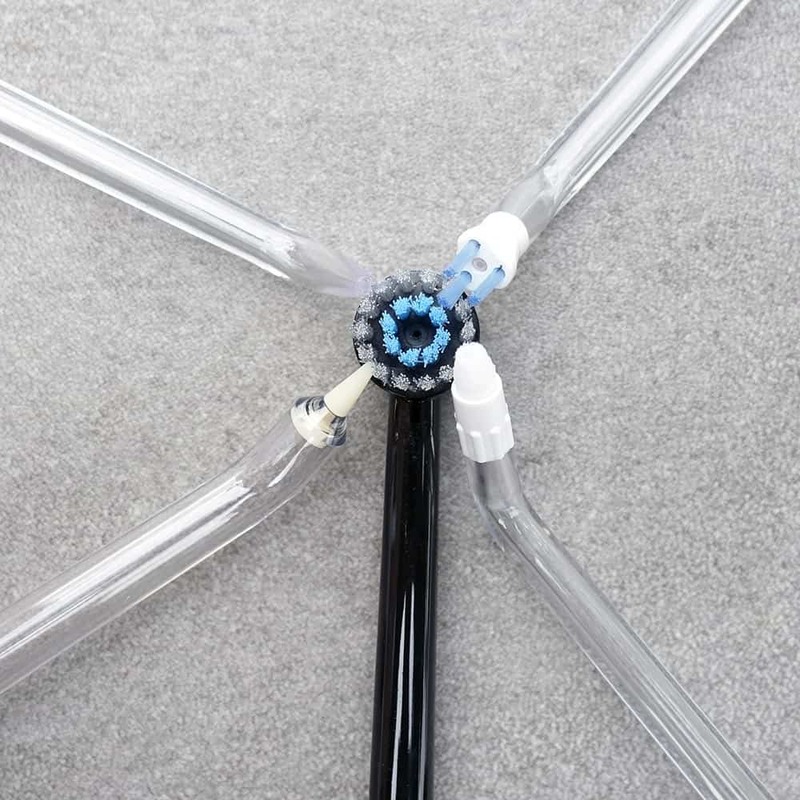 If using a Waterpik, ensure that the valve is dome side up, so that when pushed in place the 4 prongs are visible on the bottom of the reservoir. Minerals and debris can built up within the filters, pump, hose, handle and tip the water travels through. White vinegar and antibacterial mouthwashes are 2 options you have to flush through the water flosser and clean these internal parts. Fill the reservoir full of warm water and mix 1-2 ounces (2-4 tablespoons) of white vinegar or mouthwash. Place the handle of the unit (complete with tip) into the sink and leave the unit switched off. With the handle and tip facing down into the sink, over a period of about 20 minutes the solution should slowly feed through, draining into the sink and cleaning as it goes. You can after this time, power the unit on and run through any remaining mixture. Fill once again with clean, fresh warm water and run a full cycle to empty the reservoir. The clean is now complete. For conutertop models you will want to clean the handle. To do this, press the eject button on the handle to release the cleaning tip. Place the handle and the flossing tip (seperately) in a container of white vinegar and leave for 5-7 minutes. Once the time has passed, rinse the handle and tip off thoroughly with warm water. It is recommended that you replace the tip every 3-6 months, subject to which tip you use (Refer to your instruction manual for more information). Do you have any extra tips or advice to give others about how they should clean their Waterpik water flosser? Leave you comments or questions below.